Dec. 17 (Bloomberg) -- Oil traded near $73 a barrel in New York after rising the most in a month as a government report showed a decline in crude and distillate supplies in the U.S., the world’s biggest energy consumer. Oil rose 2.8 percent yesterday after the Energy Department said crude inventories declined last week to the lowest since Jan. 9. Distillate stocks, a category that includes heating oil and diesel, fell 2.95 million barrels to 164.4 million. Prices also gained as Iran tested a medium-range missile, drawing condemnation from the U.S. and U.K.
“It was distillate that charged the way,” said Richard A. Ilczyszyn, a senior market strategist with Lind-Waldock & Co. in Chicago. “The inventories were the icing on the cake” in a market poised to rally after falling to a two-month low this week, he said. Crude oil for January delivery traded at $72.85 a barrel, up 19 cents, in electronic trading on the New York Mercantile Exchange at 10:18 a.m. Sydney time. Yesterday, the contract rose $1.97 to $72.66. Futures dropped as low as $68.59 this week, the lowest point in a nine-day decline. Supplies of crude oil fell 3.69 million barrels last week to 332.4 million. They were expected to decline by 2 million barrels, according to the median of 17 estimates in a Bloomberg News survey. Oil climbed on “reduced stockpiles in the U.S. and geopolitical concerns in the Middle East,” David Taylor, a market analyst at CMC Markets in Sydney, said in a research note. The test of the upgraded Sejil-2 surface-to-surface missile “does make the case for us moving further on sanctions,” U.K. Prime Minister Gordon Brown said. Mike Hammer, spokesman for President Barack Obama, called the test worrying and said it would reinforce the concerns of the international community. Imports of crude oil in the U.S. declined 365,000 barrels to 7.77 million barrels a day, the Energy Department report showed. It was the lowest since September 2008, when ports were shut because of hurricanes Gustav and Ike. Refineries operated at 80 percent of capacity last week, down 1.1 percentage points from the prior week, the report showed. Analysts surveyed by Bloomberg News forecast a 0.3- percentage-point gain. Gasoline inventories gained 879,000 barrels to 217.2 million barrels last week. They were forecast to rise 1.25 million barrels, based on the median estimate of 18 analysts in the Bloomberg survey. Brent crude for January settlement rose $1.50, or 2.1 percent, to settle at $73.55 a barrel on the London-based ICE Futures Europe exchange. The contract expired yesterday. The more widely traded February contract gained $1.42, or 1.9 percent, to $74.29 a barrel. Dec. 17 (Bloomberg) -- The dollar traded near a 10-week high against the euro after the Federal Reserve said deterioration in the labor market is “abating,” stoking optimism about the outlook for the U.S. economy. The greenback rose against 12 of its 16 major counterparts before reports forecast to show U.S. initial jobless claims slowed and a gauge of the outlook for the world’s largest economy rose. The Fed said the economy is strengthening and most of its special liquidity facilities will expire on Feb. 1, 2010. The dollar was at $1.4525 per euro at 9:59 a.m. in Tokyo from $1.4531 in New York yesterday. It climbed on Dec. 15 to $1.4504, the highest level since Oct. 2. The dollar traded at 89.95 yen from 89.78 yesterday when it advanced to 89.99, the strongest level since Dec. 7. The euro bought 130.64 yen from 130.46. U.S. initial jobless claims fell to 465,000 last week from 474,000 in the week ended Dec. 5, according to a Bloomberg News survey before the report is released today. The Conference Board’s index of U.S. leading indicators, a gauge of the outlook for the next three to six months, rose 0.7 percent in November, following a 0.3 percent gain in the previous month, according to a separate Bloomberg survey before the release of the indicator today. Policy makers held the target rate for overnight lending between banks at zero to 0.25 percent, a decision forecast by all 98 economists in a Bloomberg survey. “There’s some acknowledgement of improved economic conditions including the labor market,” said Ray Attrill, global research director at Forecast Ltd. in Sydney. “We still think there’s a signal that informs the market there will be some Fed balance sheet shrinkage coming through in 2010,” a supportive factor for the dollar, he said. The dollar has appreciated 4 percent against the euro from this year’s weakest level of $1.5144 on Nov. 25 as government figures showed the unemployment rate fell last month to 10 percent and retail sales rose more than forecast. Before the payrolls report on Dec. 4, the greenback had fallen from the 2009 peak reached in March as investors bought higher-yielding assets funded with dollars. Investors turned bullish on the dollar for the first time since March as the U.S. economy showed evidence of a sustained recovery, a survey of Bloomberg users indicated. Sentiment toward the dollar rose to 51.99 in December, according to the survey. The measure is a diffusion index, meaning a reading above 50 indicates Bloomberg users expect the dollar to strengthen. The reading was last above 50 in March, when it reached 53.41. “With the key driving force gradually shifting toward interest-rate differentials from risk sentiment, good economic data may begin to support the dollar more directly,” said Toshiya Yamauchi, manager of foreign-exchange margin trading at Ueda Harlow Ltd. in Tokyo. Jones electronic trading were traded firm. FKLI seems holding well above short term support at 1264; 38.1% Fibonacci support levels while minor inverted head and shoulder where neck line seen at 1267 regions. 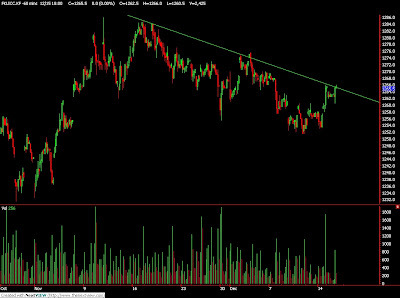 Technically, FKLI manage to penetrate resistance trend line in the hourly and daily chart; FKLI seems manage to break up convincingly from a falling wedge formation in the hourly and daily chart where support seen at 1260.5 and 1251.5 regions. Resistance levels were still expected around 1270 and 1281.5 regions. 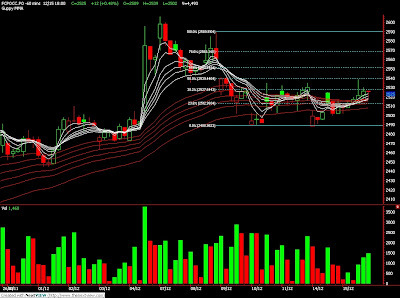 CPO 3rd month Mac futures contract traded RM57 points higher as compare to previous trading sessions to close at RM2587 with a total of 9,100 lots traded in the market. CPO price were traded strong as soybean oil and crude oil were traded firm during electronic trading sessions. Dec. 16 (Bloomberg) -- Palm oil advanced the most in more than a week after crude oil rose for the first time in 10 days, boosting prospects of the vegetable oil as a biofuel. Oil snapped the longest decline since 2001 yesterday as the Federal Reserve said that output at plants, mines and utilities rose 0.8 percent in November, the fourth increase in five months. February-delivery futures gained as much as 2.5 percent to 2,588 ringgit ($756) a ton on the Malaysia Derivatives Exchange, the most since Dec. 4. The most-active contract traded at 2,574 ringgit a ton at 12:30 p.m. break in Kuala Lumpur. Futures may climb to 2,800 ringgit to 3,000 ringgit by the end of March, Dorab Mistry, director of Godrej International Ltd., one of India’s biggest importers of vegetable oils, told a conference in New Delhi yesterday. On Dec. 4, he predicted the commodity would reach 3,000 ringgit by the end of first quarter. Palm oil has surged 51 percent this year on rising demand from India and China, the biggest consumers. Stockpiles fell 2 percent to 1.93 million tons from a 10-month high in October, the Malaysian Palm Oil Board said Dec. 10. “Supplies from Malaysia this month will be negative and stockpile will not build up significantly,” OSK’s Khor said. Shipments from Indonesia in November were 1.246 million tons, down from 1.347 million tons in the previous month, the Palm Oil Association said yesterday. PT Astra Agro Lestari’s sales of crude palm oil rose by 8.1 percent to 951,203 tons in the 11 months to November, from 879,758 tons a year ago, the company said in a filing to the Indonesia Stock Exchange today. Crude oil for January delivery traded at $70.60 a barrel, down 9 cents, in electronic trading on the New York Mercantile Exchange at 1:06 a.m. Singapore time. Yesterday, the contract rose $1.18, or 1.7 percent, to settle at $70.69. September-delivery palm oil traded on the Dalian Commodity Exchange jumped as much as 1.9 percent to 7,030 yuan ($1,030) a ton today, the most since Dec. 7. The commodity has gained 40 percent this year. China’s edible oil prices have increased partly because of higher global soybean prices, the commerce ministry said at a briefing in Beijing today. The government has taken measures to boost supply and large price volatilities are unlikely, spokesman Yao Jian said. NEW DELHI, Dec 15 (Reuters) - The benchmark crude palm oil (CPO) futures in Malaysia are expected to rise to 2,800-3,000 ringgit per tonne by March, an influential industry analyst said on Tuesday. "I believe CPO prices must rise very soon. CPO futures will trade between 2,800-3,000 ringgit by March 2010," London-based Dorab Mistry, whose forecasts are keenly watched, said at an industry conference in the Indian capital city. On Tuesday, the benchmark February contract KPOc3 on the Bursa Malaysia Derivatives Exchange closed at 2,521 ringgit per tonne, up 8 ringgit, or 0.32 percent. Mistry said 2010 palm oil output in Malaysia, the world's second-biggest producer of the cooking fat, could be lower than the 17.5 million expected in 2009, while global vegetable oil demand was expected to rise by 5.5 million tonnes. "I believe production will be even less in 2010. The high cycle which started in September this year will end in April or July next year. I am pessimistic about production in 2010," Mistry said. He said 2010 palm oil output in Indonesia, the world's biggest palm oil producer, was likely to rise by 1.0-1.5 million tonnes. Dec. 15 (Bloomberg) -- The Organization of Petroleum Exporting Countries raised the estimate for the amount of crude its members will have to pump next year as world consumption recovers. OPEC, which produces about 40 percent of the world’s oil, predicts members will need to produce 28.61 million barrels a day to satisfy demand in 2010. That’s about 100,000 barrels a day more than last month’s projection and represents an increase in 30,000 barrels a day from 2009, the first annual rise in three years. OPEC committed to reducing supply by 4.2 million barrels a day in a series of meetings late last year to combat shrinking demand. Members including Kuwait, Algeria, Libya and Qatar have said they don’t think supply quotas will change when the group meets in Angola on Dec. 22 because oil prices remain at levels members consider satisfactory. OPEC doesn’t forecast its own crude production, instead estimating the volume it will need to produce to satisfy world consumption, the so-called call on OPEC crude. It does this by subtracting projected non-OPEC oil supply, in addition to its own production of natural gas liquids and non-conventional oil, from forecast global oil demand. A rise in OPEC’s estimate for world oil consumption next year contributed to most of the increase in the call in this month’s report. Global oil demand will average 85.13 million barrels a day in 2010, according to OPEC’s estimate, an increase of 820,000 barrels a day, or 1 percent, from 2009. That growth is 70,000 barrels a day more than forecast last month. This will be partly offset by rising production from outside the producer group. Non-OPEC output is projected to average 51.27 million barrels a day in 2010, 40,000 barrels a day more than expected in last month’s report, mainly due to a revision in the estimate for 2009. In contrast, OPEC cut the estimate for its own production of natural gas liquids and non-conventional oil in 2010 to 5.26 million barrels, compared with 5.33 million barrels forecast last month. While the call increased for next year, OPEC cut its estimate for 2009 by about 70,000 barrels a day to 28.6 million barrels a day, on greater-than-expected non-OPEC production. OPEC’s compliance with its output target dropped to 58 percent in November, from 59 percent the previous month, data from the report showed. The 11 members bound by supply quotas pumped 26.612 million barrels a day last month, compared with a formal limit of 24.845 million per day. Iraq is exempt from the quota system. The 12 members including Iraq pumped 29.077 million barrels a day in November, 47,000 barrels a day more than October, according to OPEC data, which is based on secondary sources. Dec. 16 (Bloomberg) -- Oil traded near $71 a barrel in New York after rising for the first time in 10 days on a report that U.S. factories churned out more goods in November than anticipated, a signal that fuel demand will increase. Oil snapped the longest decline since 2001 yesterday as the Federal Reserve said that output at factories, mines and utilities climbed 0.8 percent in November, the fourth increase in five months. Germany’s Ifo economic institute raised its 2010 outlook for growth in Europe’s biggest economy. “The industrial production number is definitely a sign that the economy is improving, and it should lead to higher demand for oil and energy,” said Peter Beutel, president of trading adviser Cameron Hanover Inc. in New Canaan, Connecticut. Crude oil for January delivery traded at $70.85 a barrel, up 16 cents, in electronic trading on the New York Mercantile Exchange at 10:24 a.m. Sydney time. Yesterday, the contract rose $1.18, or 1.7 percent, to settle at $70.69. Futures have climbed 59 percent this year. Oil prices pared gains after the American Petroleum Institute reported at 4:33 p.m. that crude inventories rose by 924,000 million barrels last week. The U.S. Energy Department will release its weekly supply report today in Washington. Supplies are forecast to decline, a Bloomberg News survey shows. Oil-supply totals from the API and Energy Department moved in the same direction 75 percent of the time in the past four years, according to data compiled by Bloomberg. The Organization of Petroleum Exporting Countries, responsible for about 40 percent of global oil supply, raised the estimate for the amount of crude its members will have to pump next year as consumption recovers. The group will need to produce 28.61 million barrels a day to satisfy demand in 2010, it said in an e-mailed report yesterday. That’s about 100,000 barrels a day more than last month’s projection and represents an increase of 30,000 barrels a day from 2009, the first annual gain in three years. OPEC will hold its fourth and final meeting of 2009 next week in Angola. At previous gatherings this year members have called for better implementation of the 4.2 million barrels a day of cuts announced in 2008. U.S. oil inventories probably fell 2 million barrels last week from 336.1 million in the week ended Dec. 4, based on the median estimate of 17 analysts surveyed by Bloomberg News. All but one analyst predicted a decline. Brent crude oil for January settlement gained 16 cents to settle at $72.05 a barrel on the London-based ICE Futures Europe exchange yesterday. Dec. 15 (Bloomberg) -- Soybeans prices rose to a two-week high on increasing demand by Chinese importers and U.S. processors. U.S. exporters sold 290,000 metric tons to China for delivery before Sept. 1, the Department of Agriculture said today. Cumulative U.S. sales to all customers from Sept. 1 to Dec. 3 are up 56 percent from a year earlier. U.S. processors used 4.36 million tons last month, up 15 percent from a year earlier, an industry group said yesterday. “Demand is very strong, and exports to China are phenomenal,” said Dale Durchholz, the senior market analyst at AgriVisor LLC in Bloomington, Illinois. “Processors are running near 100 percent of capacity” to produce animal feed for overseas buyers, he said. Soybean futures for March delivery rose 0.25 cent to close at $10.62 a bushel on the Chicago Board of Trade, after reaching $10.7475, the highest price since Dec. 1. The contract has gained 3.4 percent in the past three sessions. Earlier, the price dropped as much as 0.5 percent on favorable weather forecasts for South American crops. U.S. soybean and livestock-feed exports have surged after drought cut output this year in Brazil and Argentina, the two biggest growers and exporters of the oilseed behind the U.S. The USDA says production in those countries slipped to 89 million metric tons this year, down 17 percent from 2008. Output in 2010 may rise 30 percent to 116 million tons, the department said last week in a report. Export sales of soybean meal, an animal feed, totaled 297,200 tons in the week ended Dec. 3, up 30 percent from the average during the previous four weeks, USDA data show. Since Oct. 1, sales surged 79 percent to 5.101 million tons from a year earlier. Soybean-meal futures for January delivery rose 60 cents, or 0.2 percent, to $316.80 per 2,000 pounds. Earlier the price reached $320.90, the highest level for a most-active contract since July 2. The most-active contract has gained 5.7 percent this year. Soybeans are the second-biggest U.S. crop, valued at $27.4 billion last year, behind corn at $47.4 billion, government figures show. Dec. 16 (Bloomberg) -- The dollar traded near a two-month high against the euro amid prospects the Federal Reserve will withdraw stimulus measures amid signs the U.S. economic recovery is gaining momentum. The greenback was near a one-week high against the yen before reports forecast to show U.S. housing starts rebounded and consumer prices gained. Traders increased bets that the Fed will raise its policy rate by June as the Federal Open Market Committee began a two-day rate-setting meeting. Australia’s dollar slumped after a government report showed the nation’s economy expanded less than economists had forecast. The dollar traded at $1.4542 per euro at 9:36 a.m. in Tokyo from $1.4538 in New York yesterday when it reached $1.4504, the strongest level since Oct. 2. The U.S. currency was at 89.58 yen from 89.61 yesterday after reaching 89.95, the strongest level since Dec. 7. The yen fetched 130.26 per euro from 130.29. Australia’s dollar sank 0.3 percent to 90.36 U.S. cents. Gross domestic product gained 0.2 percent in the third quarter, the Bureau of Statistics in Sydney said today. The median estimate from economists was for a 0.4 percent expansion. U.S. builders broke ground on 574,000 houses in November at an annual pace, up 8.5 percent, according to a Bloomberg News survey of economists ahead of the data’s release today. Consumer prices rose 0.4 percent in November on higher gasoline prices following a 0.3 percent increase in the previous month, according to the survey median before a Labor Department report today. Prices paid to producers rose 1.8 percent last month after a 0.3 percent increase in October, the Labor Department reported yesterday. The median forecast of 77 economists in a separate Bloomberg survey was for a 0.8 percent increase. Fed funds futures on the Chicago Board of Trade indicated yesterday a 53 percent chance that the Fed will raise its target lending rate by at least a quarter-percentage point by its June meeting, compared with 48 percent odds the day before. All of the 97 economists in a Bloomberg survey expect the Fed will keep the target lending rate at zero to 0.25 percent when it releases its statement today. Demand for the euro weakened after European Central Bank council member Ewald Nowotny said he sees no need to raise interest rates in the first half of 2010 as inflation pressures stay muted. “Our interest rate decisions are to be seen in connection with our price stability goal and in this context I do not see major threats for price stability in the near future,” Nowotny, 65, said in an interview in Vienna. The Frankfurt-based central bank is starting to withdraw emergency measures designed to fight the financial crisis as the euro-region economy recovers from its worst recession since World War II. While President Jean-Claude Trichet says the ECB has no immediate plan to raise its benchmark rate from the current 1 percent, officials have given themselves room to do so next year if necessary. The euro may fall for a fifth day versus the pound as Greece struggled to address concern that it isn’t doing enough to reduce its debt and Austria nationalized Hypo Alpe-Adria Bank International AG. Austria announced on Dec. 14 that it was nationalizing Hypo Alpe-Adria Bank and injecting as much as 450 million euros ($655 million) into the lender. The nation’s banks may need to strengthen their capital in the medium term, according to the central bank, citing stress-test results. Greece’s 10-year government bond fell yesterday, pushing the yield up as much as 0.29 percentage point to 5.76 percent, the highest level since April. Prime Minister George Papandreou pledged this week “radical” action to bring the country’s budget deficit within European Union limits by 2013. “Strenuous concerns over the health of finances in some member countries of the euro will exert downside pressure on the euro against the pound in the near-term,” said Akane Vallery Uchida, a currency strategist at Royal Bank of Scotland Group Plc in Tokyo. The euro traded at 89.35 U.K. pence from 89.36 yesterday when it dropped 0.6 percent. CPO 3rd month Feb futures contract ended RM12 points higher as compare to previous trading sessions to close at RM2525 with a total of 4,493 lots traded in the market. CPO price were mainly traded sideways as soybean oil and crude oil manage to recover from earlier selling pressure during morning sessions. CPO price was traded higher steadily after opened lower during morning sessions and manage to pause around 50% Fibonacci resistance levels at RM2540 regions. Based on our technical view, Guppy Multiple Moving Average show CPO price seems temporary supported around RM2490 and RM2510 region while moving averages seems expanding in the hourly chart. Resistance levels at RM2540 and RM2590 would expected be tested provided support levels were not violated during trading sessions. FKLI Dec Futures contract traded unchanged to close at 1265.5 levels as compare to previous trading session to with a total of 2,425 lots traded in the market. FKLI was mainly traded sideways throughout entire trading session despite regional indices and Dow Jones electronic trading were traded weak. FKLI still fail to trade above previous day high at 1266 region; same levels at 78.% Fibonacci resistance levels from 1251.5 to 1270 regions. Based on our technical view, FKLI possible to trade higher in the coming trading session provided manage to penetrate resistance trend line in the hourly chart while support levels at 1260 and 1251 must not be violated. Resistance levels are seen at 1270 and 1281.5 would likely be tested if bull trend was formed. Dec. 15 (Bloomberg) -- Crude oil traded near an 11-week low in New York after falling as economic reports raised concerns that demand will be slow to recover. Oil dropped for a ninth day yesterday, the longest losing stretch in eight years, amid declining industrial output in Europe and the smallest improvement this year in consumer confidence in Japan, the third-largest oil-consuming country. “You won’t have a truly healthy crude market and be able to argue for crude going above $80 until you see the developed market, North America, Europe and Asia, turn around,” said Roger Read, an analyst with Natixis Bleichroeder in Houston. Oil will trade in a $60-to-$80 range in the coming months, he said. Crude oil for January delivery traded at $69.64 a barrel, up 13 cents, in electronic trading on the New York Mercantile Exchange at 10:14 a.m. in Sydney. Yesterday, the contract fell 36 cents to $69.51, the lowest settlement since Sept. 29. European industrial output fell for the first time in six months in October, led by a slump in consumer goods. European employment declined in the third quarter. The Tankan business confidence index in Japan showed large companies planned deeper spending cuts to protect earnings under threat from the yen, which climbed to a 14-month high against the dollar in November. Prices have fallen because of a “slow recovery” in demand in developed markets, according to a Goldman Sachs Group Inc. report issued yesterday. Oil has dropped 11 percent since Dec. 1 in the longest decline since July 2001. Prices are “very suitable,” between $70 and $80 a barrel, and it’s unlikely that the Organization of Petroleum Exporting Countries will change its output levels when it meets next week in Angola, Qatari Oil Minister Abdullah bin Hamad al-Attiyah said yesterday in Kuwait City. U.S. oil inventories probably fell 2 million barrels last week from 336.1 million barrels in the week ended Dec. 4, based on the median estimate of 10 analysts surveyed by Bloomberg News, all of whom predicted a decline. Supplies are 4.8 percent higher than a year ago. Refinery utilization probably increased by 0.4 percentage point to 81.5 percent, the survey showed. Brent crude oil for January settlement gained 1 cent to $71.89 a barrel on the London-based ICE Futures Europe exchange yesterday. Dec. 15 (Bloomberg) -- The dollar may decline for a second day against the euro as signs of a sustained economic recovery and receding concerns of a default in Dubai curb demand for the greenback as a refuge. The yen, another funding currency, fell against 12 out of its 16 most-traded counterparts before reports this week forecast to show industries in the U.S. boosted production and housing starts rebounded. The pound may rise for a second day against the greenback after Abu Dhabi’s bailout of a Dubai World unit sparked an advance in U.S. stocks to the highest levels in 14 months. The dollar traded at $1.4655 per euro at 8:34 a.m. in Tokyo from $1.4656 yesterday in New York. It reached $1.4586 on Dec. 11, the strongest level since Oct. 5. The yen was at 129.97 per euro from 129.90 yesterday. The dollar fetched 88.68 yen from 88.62 in New York. The pound was at $1.6307 versus $1.6311 yesterday. U.S. industrial output probably rose 0.5 percent last month following a 0.1 percent increase in the previous month, according to a Bloomberg News survey ahead of a Federal Reserve report today. U.S. builders broke ground on 575,000 houses at an annual pace, up 8.7 percent, according to a separate survey. Asian and European shares rallied as Abu Dhabi’s $10 billion pledge allowed Dubai World’s Nakheel real-estate unit to avoid default on $4.1 billion of bond payments. Markets tumbled last month as Dubai said it was starting talks with its lenders to restructure debt accumulated during the emirate’s six-year real-estate boom. Dubai’s pledge to adopt global standards on transparency and creditor protection is a “giant step in the right direction” and the worst of the emirate’s debt crisis is over, said investor Mark Mobius, who oversees more than $30 billion as chairman of Templeton Asset Management Ltd. The Standard & Poor’s 500 Index rose for a fourth day yesterday, increasing 0.7 percent to the highest since October 2008. Losses in the dollar may be tempered on bets improving economic fundamentals may allow the Federal Reserve to seek an exit from credit easing measures next year. Futures on the Chicago Board of Trade indicated a 48 percent chance the Fed will raise the target lending rate by at least a quarter-percentage point by its June meeting. The odds were 44 percent a month ago. The central bank is next scheduled to decide on borrowing costs at its two-day meeting starting today. CPO 3rd month Feb futures contract fall RM17 points lower as compare to previous trading sessions to close at RM2513 with a total of 6,511 lots traded in the market. CPO price was traded lower as soybean oil and crude oil electronic trading were traded lower during trading sessions. CPO price recovered from early sell down during session open for trading as previous low price was traded on RM2489. Based on our technical view, CPO price have yet to penetrate resistance trend line in the hourly chart around RM2420 region. Our opinion suggests CPO price would remain bullish only provided short term support levels at RM2490 and RM2426; both were 23.6% and 38.1% Fibonacci support levels were not violated during trading sessions. 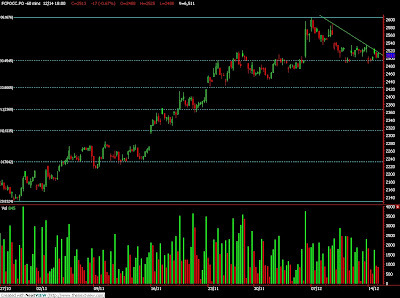 Resistance levels were seen at RM2525 and RM2535 regions. FKLI Dec Futures contract traded 9.5 points higher close at 1265.5 levels as compare to previous trading session to with a total of 4,387 lots traded in the market. FKLI was traded higher as regional indices and Dow Jones electronic trading were traded firm during trading sessions. 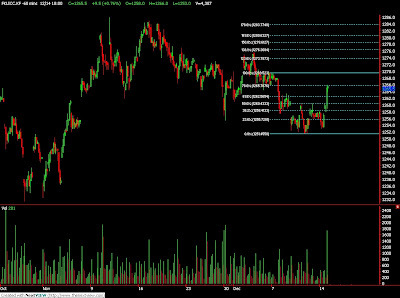 Technically, FKLI manage to rebound 78.6% from low at 1251 regions after been consolidate for more than 4 trading days. Based on our technical view, FKLI would view as bullish if price manage to trade above previous high level at 1270 regions. Our technical opinion suggests support levels at 1260 and 1251 must not be violated in order for current bull to remain intact. Resistance levels were seen at 1270 and 1281.5 regions. Dec. 11 (Bloomberg) -- The International Energy Agency cut its forecast for oil supplies from outside the Organization of Petroleum Exporting Countries next year because of delays to North American projects. Non-OPEC producers, accounting for about 60 percent of the global total, will provide 51.6 million barrels a day in 2010, or 265,000 barrels a day less than previously anticipated, the adviser to 28 nations said in its monthly report today. Projections for non-OPEC supply through to 2014 were boosted as higher investment restores delayed projects. “Some changes were made to crude project start-up dates, especially in the Gulf of Mexico, resulting in downward revisions there,” the agency said. Supplies of natural gas liquids, or NGLs, from North America will be lower than the IEA had predicted. The IEA raised its forecast for 2010 global oil demand and boosted its medium-term consumption outlook through to 2014, on expectations of economic recovery. Worldwide oil demand is likely to average 86.3 million barrels a day next year, 130,000 a day more than previously estimated, the adviser said. Between 2009 and 2014 demand will average 1.9 million barrels a day more than the agency’s last medium-term projection in June. The IEA attributed the change to “much stronger-than- expected oil demand growth in 2009 as a result of massive fiscal and monetary stimuli implemented by governments across the world” and higher growth expectations from the International Monetary Fund. Demand worldwide will increase by 1.5 million barrels a day, or 1.7 percent, in 2010 compared with this year, led by China and India, it said. The agency left demand estimates for this year unchanged at 84.9 million barrels a day. Between 2008 and 2014 non-OPEC supply will expand by 700,000 barrels a day to average 51.4 million a day, compared with a decline projected in the IEA’s last medium-term report in June. Output from OPEC, due to meet in Angola on Dec. 22 for a review of quotas, climbed to its highest in a year during November, averaging 29.1 million barrels a day, the IEA said. A lull in militant attacks on oil facilities in Nigeria was behind the increase. The compliance rate among the 11 OPEC members subject to production quotas slipped to 58 percent last month from 60 percent in October, with Iran and Angola violating their limits most, according to the agency. Dec. 14 (Bloomberg) -- Crude oil fell for a ninth day on speculation the global economy’s uneven recovery from recession may slow growth in demand for fuel and energy. The Tankan business confidence index due today in Japan, the world’s third-largest oil consumer, may show its smallest improvement since the first quarter, according to economists surveyed by Bloomberg. Oil has been pushed lower by the rising dollar and will recover as demand increases early 2010, Kuwait Oil Minister Sheikh Ahmed Al-Abdullah Al-Sabah said yesterday. Crude oil for January delivery dropped as much as 34 cents, or 0.5 percent, to $69.53 a barrel in after-hours electronic trading on the New York Mercantile Exchange. It was at $69.56 at 10:06 a.m. in Sydney and headed for the longest string of daily declines since July 2001. The contract fell 67 cents, or 0.9 percent, to $69.87 on Dec. 11, the lowest settlement since Oct. 7. Prices dropped 7.4 percent last week, the biggest decline since September, as U.S. fuel stockpiles rose and the dollar jumped to a two-month high against the euro, reducing the investment appeal of commodities. The dollar was at $1.4613 to the euro in early Asian trading, from $1.4615 late in New York last week. It earlier fell as low as $1.4599. Brent crude oil for January settlement was untraded on the London-based ICE Futures Europe exchange early today. It rose 2 cents to $71.88 a barrel on Dec. 11. Hedge-fund managers and other large speculators reduced their bets on rising oil prices to a two-month low last week, according to U.S. Commodity Futures Trading Commission data. Speculative net-long positions, the difference between orders to buy and sell the commodity, fell 11 percent to 67,817 contracts in the week ended Dec. 8, the commission said in its weekly report.